The most obvious cause of having greasy hair is an oily scalp. This usually happens due to overactive sebaceous glands producing too much sebum. In addition, factors like hormonal imbalance, stress, and intense heat and humidity, and hereditary factors may also cause the same. Thus, you can make use of a number of homemade hair masks prepared from ingredients like lemon juice, apple cider vinegar, green clay, and so on to remove dirt and reduce greasiness. Besides, you should use a shampoo that is specifically formulated for oily hair. Consider adding a few drops of sage or orange essential oil in the shampoo. Unlike those with dry hair, people with oily hair can wash their every other day. • Applying a half a cup of fuller’s earth mixed with three tablespoons of apple cider vinegar is highly beneficial for greasy hair. Leave the mixture on damp hair for 10-15 minutes before rinsing it off. • Take a handful of green clay. Mix equal parts of vinegar and water in it to make a thick paste. Apply this mask on your hair, particularly the roots, and wash it off with lukewarm water after 10 minutes. Finally, use a purifying shampoo on your hair. • Boil a tablespoon of lemongrass or peppermint in a cup of water and let it steep for about half an hour. Cool and strain the solution. Next, mix it with a quarter cup of apple cider vinegar. 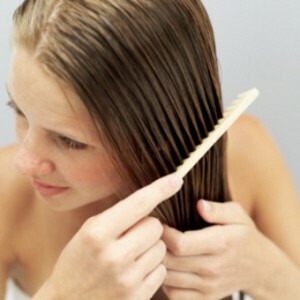 Rinse your hair with this solution and then shampoo as usual to get silky and shiny hair. • Add one tablespoon of lemon juice and two tablespoons of aloe vera gel in a quarter cup of a gentle shampoo. Wash your hair with the help of this shampoo to control greasiness in your hair. • Whisk an egg yolk mixed with one tablespoon each of lemon juice and honey. Apply this mask on your tresses and then shampoo after about 20 minutes. • Mix one teaspoon of vodka and two tablespoons of castor oil in half a cup of parsley juice. Massage this homemade hair care mask onto the roots and wear a shower cap. Wash your hair after an hour and shampoo as usual. Finally, rinse your hair with apple cider vinegar diluted in water. Follow this procedure every two weeks to maintain healthy hair and stimulate hair growth naturally. Check out this video showing how to treat oily hair with a home remedy. • Blend a tablespoon of dandelion root, an apple (sliced), and a cup of water in a blender or food processor. Next, put three tablespoons of green clay in the mixture and squeeze lemon juice in it. Leave this recipe on your hair for about an hour or so. Finally, rinse it off and shampoo as usual. • Nourish oily hair and scalp by applying a combination of half a cup of oatmeal, a quarter cup of milk, and a tablespoon of almond oil or jojoba oil. Wash it off after 15-20 minutes. • Mix one teaspoon of organic honey, and half a teaspoon each of orange and lavender essential oils in one-third cup of apple cider vinegar. Squeeze lemon juice in it. Apply this solution on damp hair and then shampoo your hair after 15-20 minutes. • Applying a mixture of five tablespoons of plain yogurt and one tablespoon each of baking soda and lemon juice is also beneficial for greasy hair. • Add two drops of rosemary or thyme essential oil in a tablespoon of lemon juice. Mix this solution in a liter of mineral water and rinse your hair with this hair care recipe maintain lustrous hair and get rid of excess oil on the scalp. • Take a cup of rosemary tea or peppermint tea. In case you do not have herbal tea, just use plain water. Add a tablespoon of vinegar and a pinch of baking soda in it. Rinse your hair with this solution after shampooing to make your hair more lustrous and less oily. • Another hair rinse to be applied on hair after shampooing involves the use of an infusion prepared by boiling a cup of apple cider vinegar and a handful of mint leaves in a cup of water.